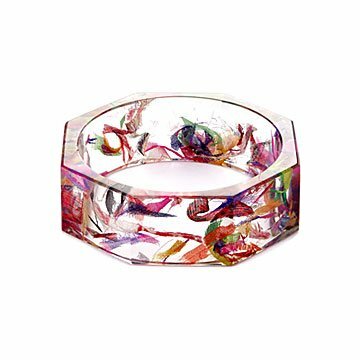 Colombian artisans embed colorful little swatches of upcycled floral saris in octagonal eco-resin bangles. Colorful scraps of floral sari fabric seem to float inside this one-of-a-kind bracelet designed by Tulianna and Alejandra Garces. Colombian artisans take tiny swatches of upcycled flower-patterned saris and preserve them in a clear, octagonal bangle made of wood-derived eco-resin, a completely renewable alternative to synthetic or petroleum-based materials. Stylish with a story, the snips pop with color in the light, and against your white shirt sleeve. Layer it with more subtle pieces for a sophisticated boho look. Handmade in Colombia. Damp cloth and gently wipe.